The Border Collie is thought to have gotten its name from the probably place of origin along the border between England and Scotland. On the English side of the fence, a few popular name ideas include London, Oscar, and Harvey. Over on the Scottish side some common names include Ceana, Conan, and Taran. The energy of the breed coupled with its athletic and often acrobatic abilities make it an excellent contender in dog sports. Some names borrowed from versatile professional athletes are Bo (Bo Jackson), Deion (Deion Sanders), Jackie (Jackie Robinson), and Thorpe (Jim Thorpe). As if the Border Collie's physical excellence were not enough, it is also commonly touted as one of the smartest dog breeds. Name ideas that highlight the intelligence of the breed can be taken from famous philosophers like Locke, Walter, and Plato. 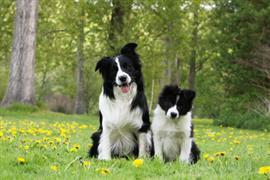 The Border Collie is a herding breed developed to herd sheep and other livestock. Some options related to herding and cattle include Buck, Ranch, and Saddle. Some of our pages will contain a subcategory. A subcategory is a slightly more specific grouping than the main topic of the page. For a subcategory, we will include a separated table of names and corresponding descriptions. An example of a subcategory of Red Dog Names would be 'Dog Names Inspired by Red Wines'. If you have any subcategory ideas for the Border Collie Names page, we would love to hear them. Use the form below to submit your ideas.